Elegant palaces, dazzling power plays, secret affairs and scandalous marriages, royal romances have been the stuff of gossip and speculation for centuries. From the fascination with Charles II's mistresses to the spectacular fall out from Henry VIII's many marriages, royal romanc... read full description below. Elegant palaces, dazzling power plays, secret affairs and scandalous marriages, royal romances have been the stuff of gossip and speculation for centuries. From the fascination with Charles II's mistresses to the spectacular fall out from Henry VIII's many marriages, royal romances have held a sway over popular culture to the mass adoration for Diana's tragic tale and the media frenzy surrounding Kate Middleton's every move. Leslie Carroll takes a look at five scandalous and seductive royal stories that will enchant and entertain royalists and lovers of history alike. Leslie Carroll is the author of several works of historical nonfiction, women's fiction, and, under the pen names Juliet Grey and Amanda Elyot, a multipublished author of historical fiction. 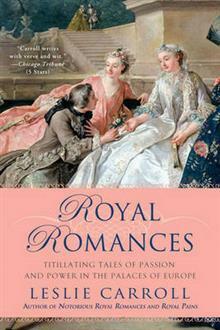 Her nonfiction titles include Royal Romances, Royal Pains, Royal Affairs, Notorious Royal Marriages, and Inglorious Royal Marriages. She is also a classically trained professional actress with numerous portrayals of virgins, vixens, and villainesses to her credit, and is an award-winning audio book narrator. A frequent commentator on royal romances and relationships, Leslie has been interviewed by numerous publications, including MSNBC.com, USA Today, the Australian Broadcasting Company, and NPR, and she was a featured royalty historian on CBS nightly news in London during the royal wedding coverage of Prince William and Catherine Middleton. She has also appeared as an expert on the love lives of Queen Victoria, Marie Antoinette, Catherine the Great, and Napoleon on the television series The Secret Life of... for Canada's History Channel. Leslie and her husband, Scott, divide their time between New York City and Denver, Colorado.